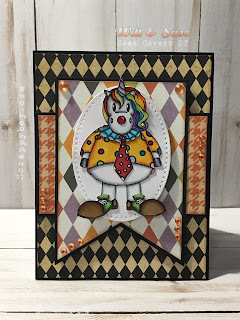 Scrappy Boy: Happy Halloween with Witt & Sass Stamp Company!!! Happy Halloween with Witt & Sass Stamp Company!!! Hello and welcome back fellow crafters!! 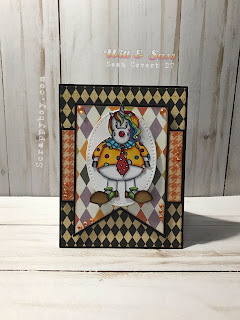 I’m back with a couple projects for Witt & Sass Stamp Company! This set is just soooo cute!!! You’re going to love it!! This is Purdee’s Halloween stamp set!!!! My first card had to be a clown after I saw those super cute shoes!! This set is just so versatile with all the little pieces to dress her up!! Here is my next card using the same set. She’s a cute little witch this time around. You can grab her here. Make sure you pop on over to the Witt & Sass blog and take a look at some of the other DT members cards!! There is some major talent going on in this group!!! Thanks and hope you enjoyed!!! Happy Halloween from Paper Nest Dolls!!! Happy Fall with Paper Nest Dolls!!! Witt & Sass Background Building! !